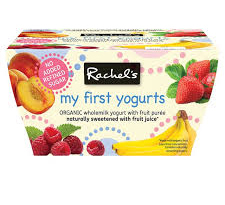 What are the healthiest fruity yoghurts for babies? I am so confused or at least I was before I started researching! Up until now I have been buying plain yoghurt for my daughter and adding my homemade fruit purées but other day I decided to buy some little pots of fruity fromage frais. I stood in the aisle for ages looking at all the different options trying to work out which one would be the healthiest. It doesn’t help that I’m the worst person at making decisions but with all the different options I really couldn’t decide. This is exactly how I felt! I had been standing there too long, I had to make a decision and with a 2-for-1 offer I bought them. It’s not till I got home that I realised it did contain sugar. I guess sugar is still a natural sweetener but I can’t help but feel a little cheated! We all know that babies and children should be avoiding sugar so why do yoghurts created for babies contain so much? 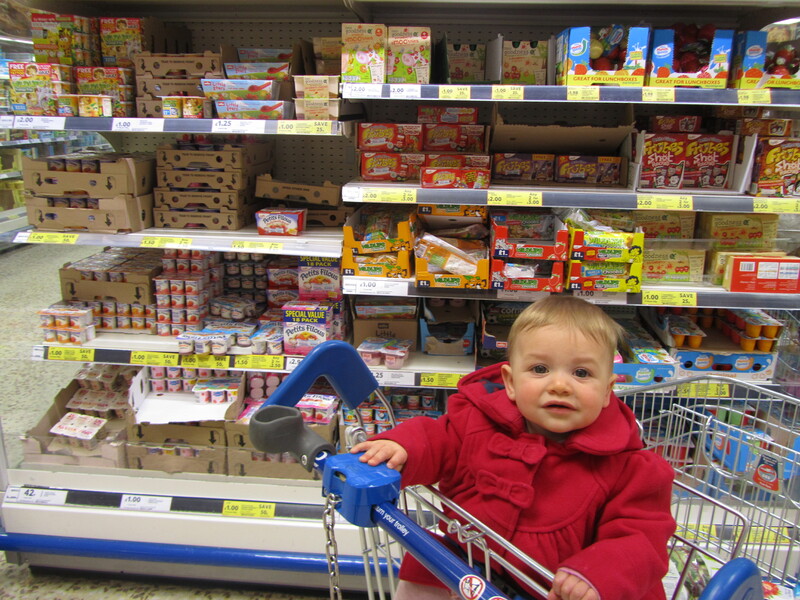 After my experience in the supermarket I set out to compare the sugar contents of most major fromage frais and yoghurts for babies and children sold in the UK. I was determined to find the best ones. It’s not and easy task! It’s hard to work out how much sugar yoghurt product contain because they have naturally occurring sugars. Lactose in yogurt is actually a sugar. So if you look at the nutritional value of plain yoghurt it will still contain sugar even though it has none added. Then there are also the natural sugars of the fruit, fructose, that are also added to the total sugar value displayed on the packet. Most companies do not give the percentage of the added sugar, but by comparing the fruit content and total sugar in all the different products I find you get a clearer picture. On top of that some labels are also misleading as some yoghurts may not have sugar listed as an ingredient but it might have added fructose or glucose-fructose syrup which is still a refined product. So, what are the results? Let’s start with the bad news…. 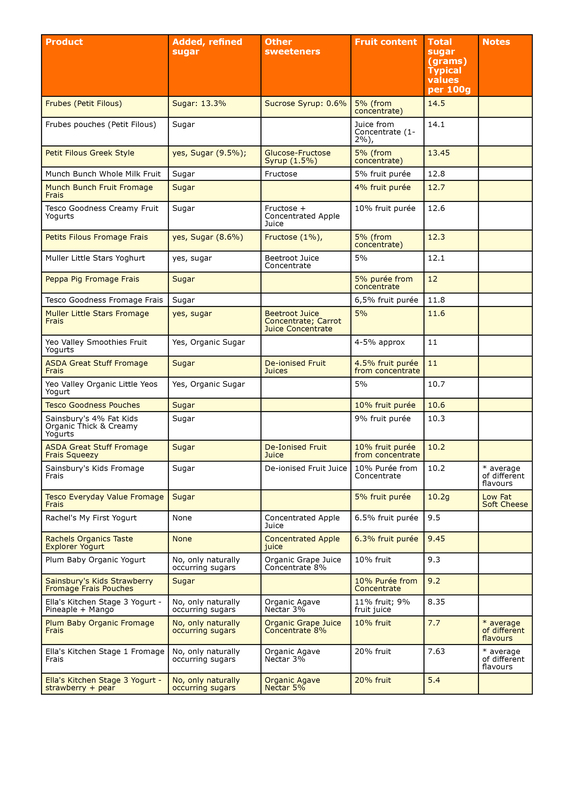 Most of the products I researched contained refined sugar and quite a lot of it. It’s difficult to know exactly how much as they don’t all say but there is consistently more refined sugar than fruit. A good tip to remember is that ingredients on food labels are listed by quantity, highest to the lowest. Most of the yoghurts and fromage frais have sugar listed as the second ingredient. Frubes have a massive 13.5% sugar, plus they have added sucrose syrup as well. 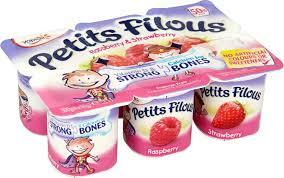 Not far behind were Petit Filous and Munch Bunch. I found only three brands that had no added sugar. Plum, Ella’s Kitchen and Rachel’s Organic. 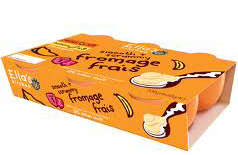 The plum fromage frais and yoghurts claim they contain 18% organic fruit. When you look at the ingredients it is actually 10% fruit and 8% fruit juice concentrate. Rachel’s Organic seems to be very similar in the way that they are sweetened using apple juice concentrate. They contain a little less fruit though at slightly more than 6%. Ella’s kitchen yoghurts seem to be the ones that contain the most fruit by far with up to 20% fruit. They use only agave nectar as a sweetener which they explain is a natural sweetener from a cactus plant. At first glance Agave nectar looks like a good alternative to sugar. It is made from the sap of a cactus plant and marketed as a less refined option. However, when you look into it a little more you very quickly find evidence that is not actually much healthier than sugar as it needs to be processed intensely to create its sweet taste. So after all this, I think I will go back to buying natural yoghurt and adding my fruit own fruit purees to them. And on the odd occasion when I need it for convenience I may get either of the three with no added sugar. For my complete results have a look at the table below. Please bear in mind that the total sugar value includes added sugar and naturally occurring sugars. They are ordered by sugar nutritional value per 100g not content so take a look at the fruit content as well. Thanks for advice about Greek Yoghurt. I will try it, because I always take a different. I like your blog too…you have a new follower! Thanks Emma, glad you liked it! Feel free to link to my chart from your site…Good suggestion too! Fructose-glucose syrup is NOT refine sugar. I rather feed my child refine sugar then artificial sweeteners or Fructose-glucose syrup (HFCS). Thanks for picking this up! I meant it’s a refined product. I would also prefer using refined sugar than artificial sweeteners or fructose- glucose syrup! Thank you so much for this! I have been doing exactly what you did … oddly staring at various baby yoghurts for an age in an attempt to decipher the sugar content and work out how much refined sugar has been added. It is so difficult to get past the ‘healthy’ slogans describing how they are designed for babies and children!!! This is wonderful, thanks for saving me the trouble, I do use natural yoghurt and fruit but in emergencies will just stick to the three you have listed thanks. One question though I hate shopping and prefer a once a month shop as much as possible any ideas how to preserve natural/ greek yoghurt that long for a baby? may sound silly but important to me. Hi, I’m glad you found this useful. Even better, you could try making your own yoghurt! thank you so much!! What a HUGE change i just made in my sons lunch box and the ellas kitchen was on a 2 for £3 the same as the others i use to buy! I was really impressed by your blog, you put a lot of research into it. It’s so hard deciphering the nutritional values! I have just started blogging with my sister about baby led weaning and recently did a sugar and salt blog- http://www.minimunchclub.com/keeping-your-baby-and-families-sugar-salt-intake-low/, reading your blog gave me the confidence to name brands as examples of how baby marketed foods were still high in sugar and salt. Thank you. Thanks for your comments Sarah, your blog looks great, keep it going! .. also can make them look AMAZING !.. layers of each with ground flaxseed/ chia seeds etc … really stunning!.. and you can freeze a batch at a time and itll keep packed lunches cool too! I hadn’t thought about freezing them..great idea. Thanks Louisa! So grateful to you for putting all your research into this online. I am at the beginning of an anti-added sugar drive, especially with regards to what I feed my 5 year old. Why everything has to be sweetened so much I don’t know. Even her school puddings are disgraceful – stodgy puddings with custard, muffins, oh and a choice of fresh fruit. My mum’s given me an Esiyo yoghurt maker which you buy sachets for so you can choose unsweetened sachets. I’m yet to try it but I have high hopes. I need to do something to win back the family’s taste buds to a more natural sweet flavour!